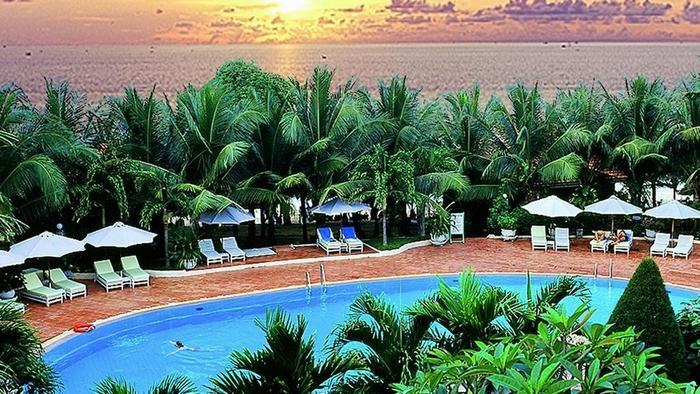 Saigon - Phu Quoc Resort is one of the best places for tourists to stay when traveling to Phu Quoc Island. 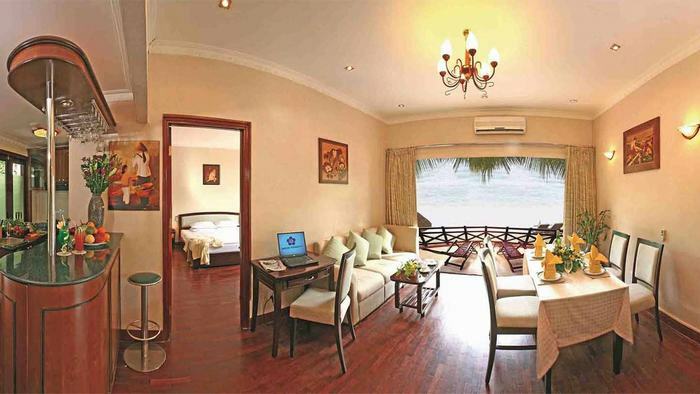 If you are looking for a delightful holiday, do not hesitate to choose Saigon - Phu Quoc Resort as your companion. From Tan Son Nhat airport: 300km, 60-minute flight with ATR 72, 10 flights per day. 131km from Rach Gia airport, 30-minute flight with ATR 72, 02 flights per day. From Rach Gia port: 120km, 150 minutes of the high-speed boat, 06 trips per day. 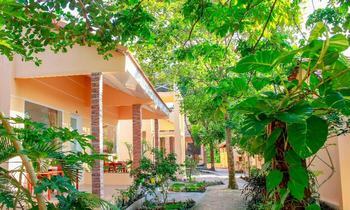 SAIGON-PHUQUOC Resort & Spa: Stretching over 3.4 hectares, on the West Coast, the resort offers 100 bungalows and villas (comprise bedroom, sofa bed, living room, bar connecting with dining space and kitchen). The property offers the newest 2 meeting rooms for 10 to 250 seats with many other facilities and an experienced and dedicated team suitable for all your major important events. The property also offers 24 unique services, outdoor activities, 03 restaurants, and 02 bars. President I: one 53m2-large villa by rare wood, next to the beach, sea view balconies overlooking the ocean; dining room equipped with kitchen, bar, PC and iPod speaker, separated from the bed and bath with Jacuzzi stand tub; a nearly 450m2-large-garden surrounding. President II: 11 villas (nearly-59m2-large/each), sea view balconies overlooking the ocean. Next to beach: 5/11 villas; have a dining room with kitchen, bar and sofa bed: 9/11 villas; for wheelchair alley, bathroom equipped with shower, Jacuzzi bathtub and bathroom-window overlooking the ocean: 6/11 villas; a nearly-350m2-large garden surrounding. V.I.P/Family: 38 rooms (33m2/each), sea view or garden view balcony; wheelchair alley: 1/38 room, Jacuzzi stand tub or bathtub. 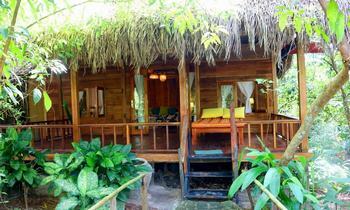 V.I.P bungalows facing the sea, listening to the rhythm surf wave. From these balconies or bedrooms, you can enjoy the sunset, see hundreds of electric light on the fishermen boat, sparkling like a city off the coast nightly; a nearly-250m2-large garden surrounding. Roofed with coconut leaf, surrounded by a yard, next to the beach, listening to the sound of the wave, enjoy buffet breakfast, Phu Quoc special seafood daily and seafood barbecue party every day. There is also a pizza cooker and bar for a cocktail and draught beer, the 100 – seat restaurant is open daily from 6 am to midnight. Located on the first floor with 50 seats, overlooking the swimming pool and ocean, choices of Japanese, Korean or Chinese Cuisine,. Seafood Buffet on every Mon at 6.30 PM. Open daily from 8 am to midnight. Located on the first floor, European cuisine restaurant ranges up to 150 seats; additional Foster draught beer is served at Saigon bar, buffet breakfast and A la carte served every day. From the seat overlooking the panoramic view of Thailand’s bay, observing the sunset down to the ocean. Open daily from 6 am to midnight. Pool bar animated with discotheque, satellite TV serve from 8 am to midnight with the snack, pizza, ice-cream, cake, and Foster draught beer. Where you can spread your legs on the top of sea waves, enjoy the beach’s music rink slowly soft drink, wine and beer, have A la carte or seafood barbecue. Lying on the sofa beach and ordering the waiter. The most impressible feeling is to contemplate the splendid and majestic of the sunset down to the ocean. Open daily from 8 am to midnight. Training aerobics is available at 6 am every morning. Beauty salon: Hands & feet paraffin * Shampoo * Blow dry – hair/ oil steaming hair ironing * Ear washing/ shaving * Haircut * Manicure * Pedicure * Fingers – nail/ toes – nail painting * Toes – nail/ fingers sticking * Dead facial cell peeling by skin cream * Face massage * Head & neck massage * Arm/ half leg/ full leg/ underarm/ back waxing * Whitening bath * Apply mud * Crocus + Orange + Honey bath * Body fruit wrap * Aromatherapy massage. Beauty spa: Hot stone massage * Body/ foot massage * Sauna * Steam * Jacuzzi * In-room massage * Beach massage * Japanese point acupuncture * Traditional Thai body massage * Traditional Indonesian foot reflexology. Slot machines for everybody playing together: black, jack, baccarat, roulette, slot and poker, 100 percent brand new from European. Players can enjoy bar, discotheque, karaoke, spa. 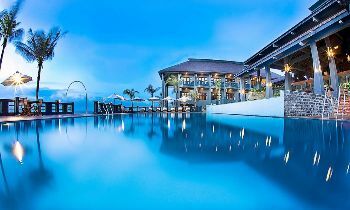 Known as the premier resort and spa in Phuquoc island, Sai Gon – Phu Quoc offers 5-star services and facilities such as wi-fi, ATM, airlines ticket, airport transfer; outdoor activities such as beauty spa, driving range, petanque, billiards, discotheque, kayak, fishing & squid fishing, snorkeling, scuba diving, cooking instruction, sightseeing tour, boat trip, horse riding, bicycle, walking & trekking and gaming club (coming soon) such as blackjack, roulette, baccarat, poker. For more information about tours in Phu Quoc, please visit our website. If you have any questions, feel free to contact us. Hope that this article is useful for you. Have a nice trip!